Author: Douglas Curran, Peter Probst. The author works as a photographer with the aim of documenting aspects of belief and culture of various ethnic and religious communities. His latest project focuses on the nyau masks and rituals of the Chewa of central Malawi. The term nyau has many dimensions – it describes a secret mask association of the Chewa, the self-made masks and disguises they use, their dancing rituals as well as the religious and moral universe they operate in. The nyau dancers represent the spirits of the ancestors and wild animals and portray as well as renew the rules and traditions of the community, mainly by reversed role-playing. The nyau rituals also allow to ease social tension in a closed society reliant on consensual decision making, and have been surprisingly adaptive to circumstance, incorporating the new and the foreign into the fabric of nyau practice. 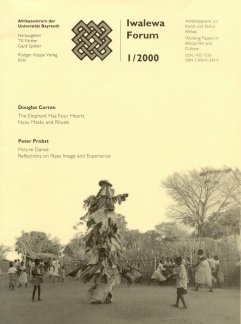 This article widens and strenghtens the information given by Douglas Curran with a view to the aesthetic and ethnographic dimension of his photographic work. Douglas Curran’s photos run against the clear western disitinction between these two concepts, calling into question the validity of such dichotomies as subject and object, action and art. Instead, they include all these qualities by setting the mask and its wearer into context. Thus, the photos achieve something greater than the simple addition of aesthetic and ethnographic object. Nyau can mean many things to different people at once, depending on their current perception and involvement in the action. Its flexibility and openness are dominant features, which make it difficult to pin down its precise meaning. 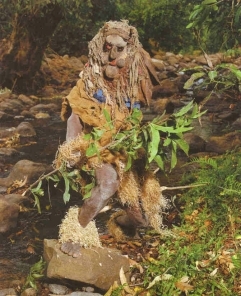 Nyau mask dancing is performed in the village communities at funerals and initiations. Thus it accompanies two of the most important occasions in a person’s life, and serves to reassure the community of their rules and traditions. Nyau masks always entail a double representation – they depict aspects of mythical, historical, and social experiences just as they recall these experiences, yet they are also bound to the concrete individual behind the mask. As the nyau ritual is regarded to take place outside the normal moral and judicial bounds, it allows for tension release and the voicing of dissent.